This was awesome fresh out of the oven as well as reheated. How gorgeous is that? If you reheat the leftovers, highly recommend using the oven or a toaster oven versus the microwave so you still get some crunch. The microwave makes it all chewy. 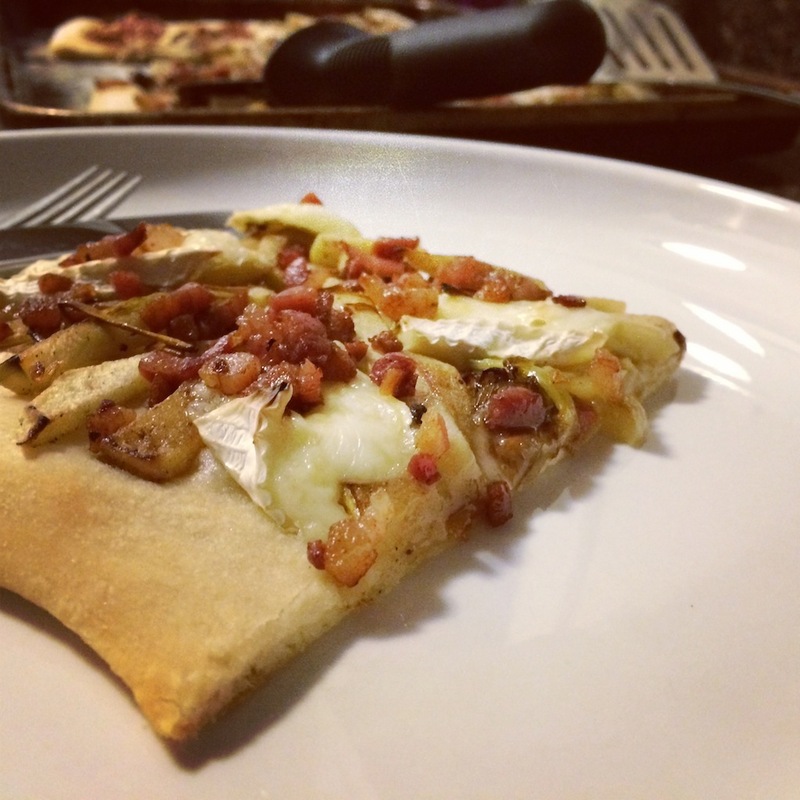 I bought the pizza dough pre-made at Whole Foods, but you could choose to make it yourself. Trader Joe’s also sells a frozen dough. I bought the pancetta pre-diced which made my life much easier. If you don’t, make sure you buy it from the deli (it’s got to be a nicer deli that sells pancetta) and have the butcher thick slice it for you. Traditionally pancetta will be sliced really thin and you don’t want that here. The better the cheese, the better the pizza. Amen to that. In a large skillet over medium-high heat, heat the olive oil. Add the pancetta and cook until just crisp. Remove to a paper-towel lined plate. Remove all but 1 tablespoon of the fat from the skillet and add the leeks. Sprinkle with the pepper and a pinch of salt and cook over medium-high heat, stirring occasionally, until the leeks start to brown, 6 to 8 minutes. Add the apples and cook for 5 minutes more, until the apples are golden but not falling apart. Turn off the heat. Stretch the dough into a round. Top with the apple and leek mixture, then the Brie. Bake the pizza for 10 to 12 minutes, until the crust is golden. 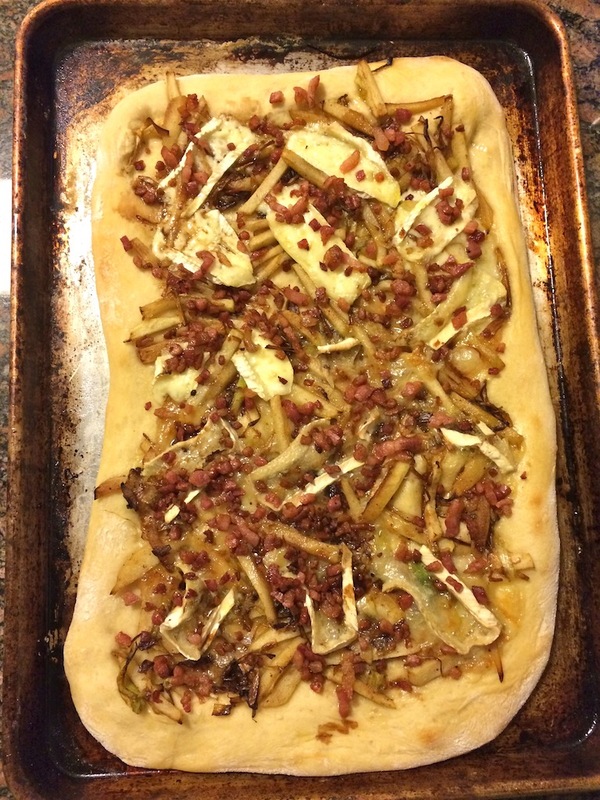 Sprinkle with the pancetta, drizzle with the vinegar and extra virgin olive oil, slice and serve. 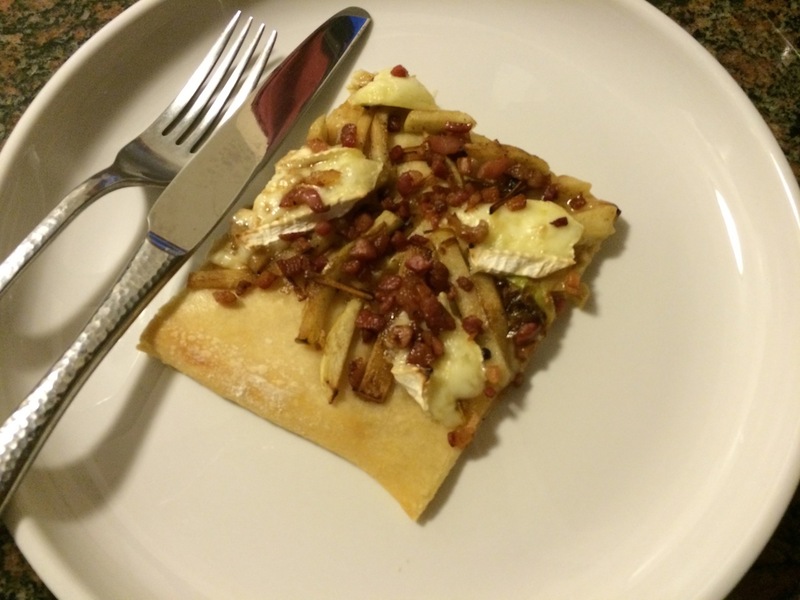 This entry was posted in Recipes, Uncategorized and tagged apple, brie, french pig pizza, leeks, pancetta, pizza by Tricia. Bookmark the permalink.